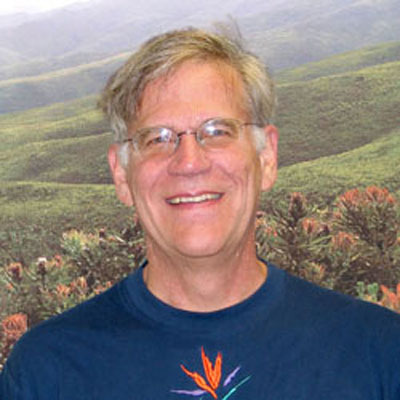 EEB Faculty: John A. Silander, Jr.
Plant ecology and evolution: biogeography and spatial processes in ecology; landscape ecology; conservation biology; biology of invasive species; experimental plant population and community ecology; population dynamics and competition; forest community ecology of temperate and tropical regions.  Gelfand, A. E., J. A. Silander, Jr., S. Wu, A. M. Latimer, P. Lewis, Anthony G. Rebelo and M. Holder. 2005. Explaining species distribution patterns through hierarchical modeling. Bayesian Analysis 1:42-92. (pdf file ) (with supplement). Leicht , S.A. , J.A. Silander, Jr. and K.E. Lerose. 2005. Assessing the competitive ability of Japanese stilt grass, Microstegium vimineum (Trin.) A. Camus. Journal of the Torrey Botanical Society 132 (4): 573-580 (pdf file ). Latimer, A.M., J.A. Silander, Jr. and R.M Cowling. 2005. Neutral theory reveals isolation and rapid speciation in a biodiversity hotspot. Science 309:1722-1725 (pdf file ) (plus appendices). Latimer, A. M., S. Wu, A. E. Gelfand and J. A. Silander, Jr. 2006. Building statistical models to analyze species distributions. Ecological Applications 16(1): 33-50 (pdf file ) plus Appendices: Ecological Archives: A016-003-A1 and A016-003-S1. Leicht, S. A. and J. A. Silander Jr. 2006. Differential Responses of Invasive Celastrus orbiculatus (Celastraceae) and Native C. scandens to Changes in Light Quality. American Journal of Botany 93(7): 972-977 (pdf file ). Courses Taught: Methods of Ecology, Field Ecology, Seminars in plant ecology and spatial statistics. 1. 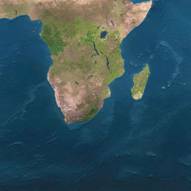 The Biogeography, Biodiversity and Climate Change in Southern Africa. This project is multidisciplinary, combining ecology, evolution, genetics, biogeography, climate change and statistics, supported by successive NSF grants. The first objective of the project was to explain biogeographic patterns of plant species distributions and biodiversity in the Cape Floristic Region of South Africa. 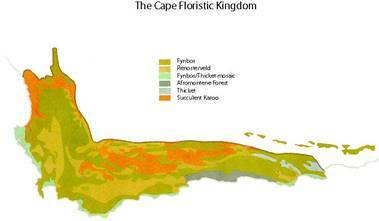 The “Cape” is biotically one of the most diverse regions in the world, as diverse as many of the world's rainforests. 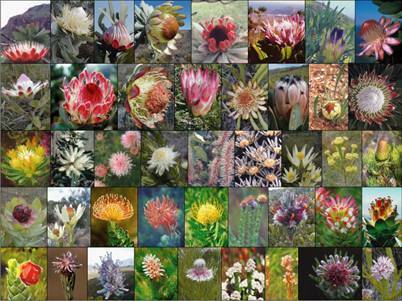 The focal plant group for this study was initially the Proteacea, the iconic plant family of South Africa. We developed novel, spatially explicit statistical models (Hierarchical Bayesian) to understand and predict patterns in species distributions and biodiversity. The data sources include GIS (environmental) data layers, species attribute data, species inventories (from the Protea Atlas Project), phylogenetic information, and other data sources. 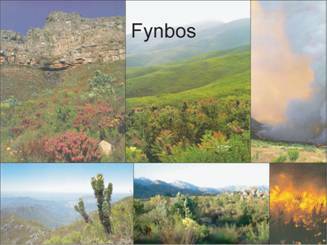 Extensive field work including experimental biogeography and population genetic analyses was conducted in South Africa. Selected recent papers and manuscripts are listed above. Continued NSF funding has allowed us to explore climate change in Southern Africa and the predicted population and species levels responses of proteas to past and future projected climate change. We also developed models predicting wildfires, biomass change, and ecosystem resilience over time. A related NSF project focuses on evolutionary processes in Protea species. An NSF-IRES grant provided research training support for undergraduate and graduate students studying the ecology and evolutionary biology of the Cape Floristic Region. Most recently, an NSF Dimensions of Biodiversity grant has allowed us to expand our study of biodiversity in the Cape Florist Region to focus on phylogeography, and the genetic and evolutionary basis of plant functional trait variation in two diverse plant genera in the Cape: Protea and Pelargonium. In addition, we are looking at the spatial and temporal dynamics of the plant communities in which these genera occur. Finally, we are developing mechanistically based, predictive range models of proteas, based on integral projection models that will allow us to forecast how species ranges may change over time as climate changes. 2. The Ecology of Invasive Plant Species in New England. This project has focused on developing an on-line atlas and interactive database for invasive plant species and noxious weeds of New England. We are collecting both historical (herbarium) and current field records of species occurrences. With this information we have developed models to predict current and future patterns of invasive species distributions. An integral part of the project is developing an early-detection/early-warning system for new incursions of invasives in the landscape. 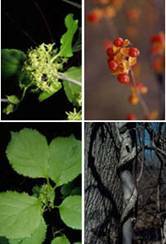 We are also focusing ecological studies on selected problematic species, including the comparative ecology of native and invasive oriental bittersweet (Celastrus orbiculatus) and Japanese barberry (Berberis thunbergii) species in New England. Another project has focused on the effects of land-use history on susceptibility to biological invasions, and how land-use and land-use change are driven by socio-economic drivers. This project was funded by the USDA. Our IPANE Invasives web site is constantly being updated, and we have recently developed a collaborative relationship with EDDMapS.org to serve our data. We have developed predictive models of invasive species distributions using data from both their native ranges (focus on East Asian species) and where they have been introduced to the US and elsewhere. In addition, we have developed mechanistic, spatially explicit grid-based models of the joint spread of invasive plants and the bird species that disperse them. 3. Phenological Responses of East Asian species to Climate Change. This is a collaborative project funded by NSF that involves researches from UConn, Boston U, U Michigan, plus colleague s from Japan, South Korea and China. The focus is on how species of plants and animals and the communities they occur in have responded phenologically to climate change in the past and how they are forecast to respond in the future. We have used long-term phenological observations in Japan, South Korea and China, paired with meteorological stations, and we have also collaborated with the Japanese Center for Climate System Research for Regional Climate Model projections for the region for the future. Our group has focused on building mechanistic Hierarchical Bayesian models to predictive responses of flowering cherries to past and future climate change. We are also building HB landscape models of forest community responses to past and future climate change comparing responses in New England and East Asia. 4. 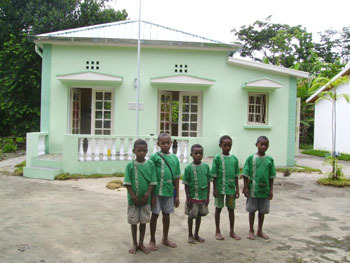 Sustainable Conservation in Madagascar. Prior funding from the MacArthur Foundation and NSF focused on understanding and explaining deforestation patterns over time in the eastern coastal rainforests of Madagascar. This project was multidisciplinary involving ecologists, anthropologists, archeologists, geographers, demographers and rural sociologists. Collaborators on this project included former student Dr. Joelisoa Ratsirarson. An experimental component of this project, done in collaboration with former student and post-doctoral fellow, Dr. Roland de Gouvenain, focused on understanding and predicting forest dynamics and regeneration of native tree species. 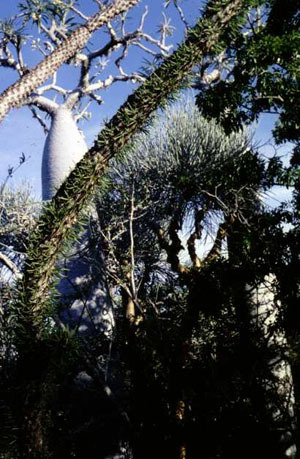 A May 2006 expedition to Madagascar focused on the status and evolution of grassland and savanna systems. Grasslands and conservation of their biota have been largely ignored in Madagascar. We also initiated a study on the coevolutionary history of giant elephant birds and the vegetation they browsed in the thicket biome of southwestern Madagascar (see paper published in the PRS, and highlighted in Current Biology). 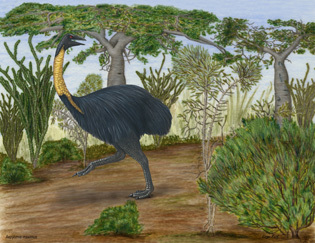 On-going research focuses on the biology and evolution of the enigmatic elephant birds of Madagascar. A recent, collaborative grant from the MacArthur Foundation (UConn, U Antananarivo and U Cape Town) focuses on training the next generation of researchers in Madagascar on Sustainable Biodiversity, Conservation, and Climate Change Science and Policy. Tampolo Forest Reserve: wet tropical forest zone of eastern Madagascar. This is the focal site for the tropical deforestation project initially funded by the MacArthur Foundation. 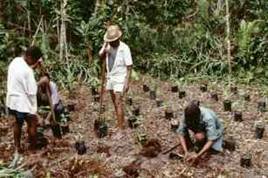 Experimental plantings of forest tree seedlings in the Tampolo forest. Cory Merow, Ph.D.: Developing and assessing modeling strategies in plant population and community ecology. Jenica Allen, Ph.D.: Global Change Ecology: Native and Invasive Species Responses to Climate and Land Use at Local to Biogeographic Scales. Sarah Bois, Ph.D.: Invasive species colonization potential in New England: distribution, demography and adaptation. 2006: Andrew Latimer, Ph.D.: Environmental and geographical controls on species distributions: a case study on proteas in the cape floristic region. 2005: Stacey Leicht-Young, Ph.D.: The comparative ecology of an invasive bittersweet species (Celastrus orbiculatus) and its native congener (C. scandens). 2005: Nava Tabak, M.S. : Assessing the invasive potential of Impatiens glandulifera (ornamental jewelweed) in New England. 2004: Steve Citron Pousty. Ph.D.: Population response to spatial heterogeneity: Hemilepistus reaumuri as a case study. 2004: Eric Mosher, M.S. : Evaluating the contribution of land-use history to woody plant inavasions across a heterogeneous landscape. 2002: Ricardo Rozzi, Ph.D. Biological and cultural conservation in the archipelago forest ecosystems of southern Chile. 2001: Roland de Gouvenain, Ph.D.: Regeneration dynamics of a Madagascar rainforest and their relationship to human disturbances. 1998: John Caspersen, Ph.D.: Forest landscape dynamics: consequences of interspecific variation in drought and shade tolerance. 1994: Jim Hill, Ph.D.: Population dynamics of hay-scented fern (Dennstaedtia punctilobula) and its impact on forest composition structure and dynamics. 1996: Adrien Finzi, Ph.D.: Causes and consequences of soil resource heterogeneity in a transition oak - northern hardwood forest. 1995: Rich Kobe, Ph.D.: Scaling from individuals to forest communities and landscapes with models of juvenile tree growth and mortality. 1988: Eric Ribbens, Ph.D.: Predicting tree seedling distribution: the role of recruitment in forest community dynamics. 1993: Joel Ratsirarson, Ph.D. Population biology and conservation of an endangered Madagascar triangle palm: Neodypsis decaryi. 1989: Michelle Zielinski, M.S. : Demography, genetic diversity, and light requirements of the rare plant Trollius laxus ssp. laxus. 1992: Loretta Johnson, Ph.D.: Species-regulated Sphagnum decay in peat bogs. 1987: Greg Miller, Ph.D.: The population biology and physiological ecology of species of Puya (Bromeliaceae) in the Ecuadorian Andes.